Model 3CM-5X-3 offers simple operation and elimination of jabor-intensive work, giving an improvement in process efficiency. The folder is easy to use. The filled bag is set, and the machine does the rest	automatically. Folding, once heavy work, becomes an easy and efficiently accomplished job. 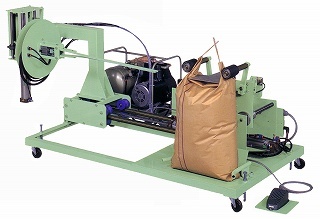 ※１Contact us for applications involving common use of different bags, use of special bags, and bag dimensions and set weights outside the above range.